(Bethany Rodgers | The Salt Lake Tribune) Mark Briesacher, Intermountain Healthcare's chief physician executive, holds a news conference to explain the health giant's new policy on recommending medical cannabis. Feb. 14, 2019, at the Salt Lake Clinic in Salt Lake City. Patient advocates Thursday celebrated Intermountain Healthcare's entrance to the world of cannabis treatment, saying they hope the state's largest medical system is cutting a path for other physician networks. “This is a great moment to have [Intermountain] standing with patients and having that relationship with doctors and patients honored and respected,” said Christine Stenquist, founder of Together for Responsible Use and Cannabis Education. Intermountain sent out new guidance to its providers Wednesday, reversing a previous directive against writing cannabis recommendations for patients. On Thursday, the health group’s leaders — joined by medical marijuana advocates — made the changes public during a Salt Lake City news conference. Former state lawmaker Steve Urquhart, an early proponent of medical cannabis in Utah, said the announcement means conversations about marijuana treatments can move into the clinics, where they've always belonged. "The shift I hope happened right here at this podium ... is that the dialogue will move away from politics," Urquhart said. "And the dialogue will now be between patients and their providers." 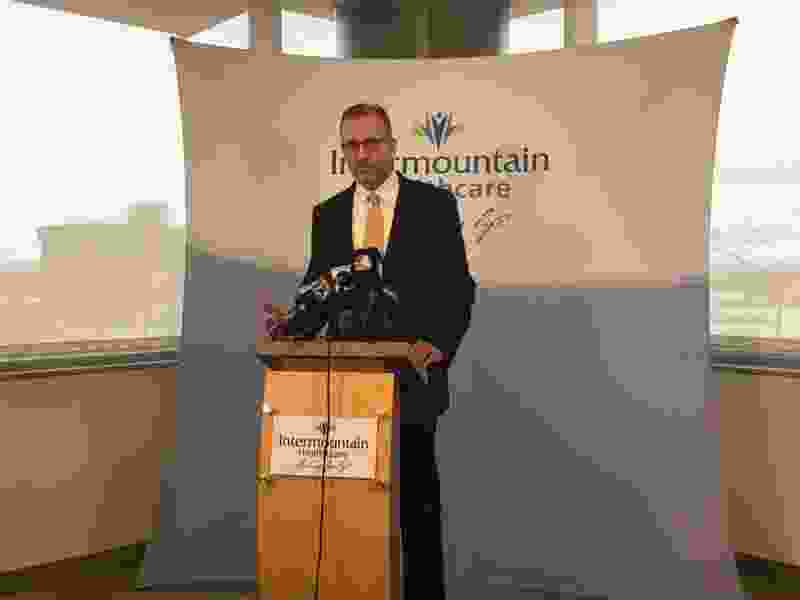 Intermountain’s chief physician executive, Mark Briesacher, said his network has been conversing with patients and families, medical providers across the nation, advocates and pharmacists in the weeks since the Utah Legislature passed the state’s cannabis act, replacing the voter-approved initiative to legalize medical cannabis. The goal was to understand the new law and craft guidance that would serve medical providers and patients alike, he said. To that end, the health system has created a form letter that providers can use when appropriate to recommend cannabis to patients. The document — which explains that the person has a qualifying ailment under the state law and that the provider believes medical cannabis could be a beneficial treatment — is a form of proof that patients can produce if they’re caught carrying the federally illegal substance. Under the new law, the letters will afford patients some legal protection while Utah’s full medical cannabis program ramps up over the next couple of years. Initially, Intermountain advised its network not to issue the recommendations, with Briesacher saying there were “too many unknown details at this point for these letters to be provided to patients.” Physicians in other groups also seemed uncertain. Connor Boyack, an advocate who was central in crafting the state’s cannabis law, said he’s heard from patients across the state who’ve been frustrated that their doctors won’t discuss cannabis treatments. Even with Intermountain’s new policy, Briesacher explained that the medical community is still learning about medical cannabis treatments and cautioned that physicians are not obligated to write letters for patients. The health system has formed a working group of primary care, neurology, palliative care, emergency medicine, advanced practice clinicians, nursing and pharmacy specialists who will advise leaders on best practices, and Briesacher said he expected experts on cannabis medicine would emerge within Intermountain. Desiree Hennessy of the Utah Patients Coalition said she was grateful that Intermountain was committed to implementing the new law responsibly. Even with the letters, Stenquist explained, patients currently lack a legal avenue for accessing cannabis; until the state’s distribution system is up and running, they must resort to the black market or traveling across state lines to recreational dispensaries.